Outstanding exploration project/ REE play available. Unmined historic reserves in area exceeding 3 million pounds coltan with likely equal amount of HREE enriched monazite running 25% TREO. 10 unpatented claims approximately 1600 acres near water and infrastructure in a mining friendly US state. Recent scientific work. Active reserve exploration program in progress. 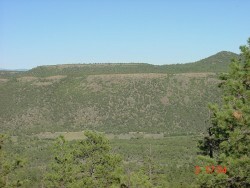 Directly west of the village of Petaca, which lies about 45 air miles west of Taos, New Mexico, USA. Paved road access runs all the way south from Petaca into Ojo Caliente then north to Tres Piedras and finally east into Taos, New Mexico. Outstanding grass-roots exploration project/ REE play available for sale, JV, lease, or lease w/purchase option. Featuring historic production, historic reserve estimates done by large national mining company with unmined historic reserves in area exceeding 3-5 million pounds of coltan at depths of less than 30 feet. Historic hard-rock mica production records indicate amounts of monazite equal to coltan concentration, plus a few percent of other exotic rare earth minerals. Recent (2011) work at the University of New Mexico indicates the monazite and polycrase-samarskite-euxenite mineralization contain an unusually high bias towards the more valuable heavy REE's, including a polycrase with 3%+ Dysprosium content, and a piece of fluorite containing 10% +yttrium from xenotime inclusions. I have sampled the surface on a limited basis and assayed surface soil and dumps. Recent ICP-MS assay reports are available for a few dozen samples. 1000 lbs+ of raw bulk placer samples in hand. Ongoing academic investigations include a revision to the area's geologic map by the State, scientific papers through UNM on the distribution of REE mineralization in selected area pegmatite mines, work on geologic dating of muscovite and monazite, and I've heard rumors a New Mexico Tech student is working on metallurgical separation process for Coats Mine monazite under DOD funding. Currently a small scale reserves survey is underway consisting of soil sampling in stream beds and sampling of the small dumps left over from early 1900's mica mining. This season I hope to define at least one target capable of producing $3-$5 million in profit over a 5 year period or less, on a $1 million investment. Geologically speaking the abundant REE and coltan mineralization present in the numerous old mica workings strongly indicate the presence of several of these small scale, highly profitable, fast return deposits on the 1600 acre claim block I currently control. I need an experienced partner or customer with the insight to turn this into a small scale operation designed to fulfill the urgent need for domestic Rare Earth production. I have done a lot of the foot work needed to create an opportunity for a smart and connected person or group to turn this into an investment opportunity of unparalleled appeal. Precambrian granites and ancient metamorphics, overlain by complex volcanics. Abundant pegmatites along granite-schist contacts. Pegmatite composition ranges from an early quartz-feldspar with minor samarskite to late stage highly complex and replaced pegmatites containing quartz-feldspar, muscovite, garnet, fluorite, columbite-tantalite(coltan), monazite, hematite-illmenite, beryl, and the polycrase series minerals. Emphasis is on the late-stage complex minerals which display an unusually high bias towards significant HREE enrichment. Recent chemical analysis of mineral specimens collected from mines on my claims and across the district indicate this bias occurs on a widespread distribution throughout the Petaca region. Mica production from pre-Colombian times to present. Ironically, in the late 1800's muscovite mica for window pane use was shipped to Moscow, Russia. During WWII the area saw significant scrap mica production to support wartime electronics manufacture. In 1954 ASARCO explored the area and located several potential placer bodies, including a 223 acre "test pit area" directly adjacent to the village of Petaca estimated to contain 3-5 million pounds of coltan reserves. By the late 1950's more economical deposits had been developed overseas, which has led to this area remaining unmined. Paved road access runs into Petaca, the placers are within 1-5 miles to the west along well maintained county and forest service roads, with the water available from Tusas river. Only limited electricity is available, but ROW is open for development. Good pool of semi- and unskilled workers available within 5-50 miles. In 2012 a valid placer permit was in hand but illness at the beginning at the season forced me to quit before production got underway. I have a certified PG on retainer who can author a NI 43-101 compliant report once we generate enough good, recent data for him to use. Terms: $500,000 for outright sale, including: 10 placer claims at approximately 160 acres each, 1600 acres total. All historical information and current research, plus records of claim maintenance. PG retainer. All placer samples in hand. Running Mobil Drill Company "Minuteman" auger/drill unit with a few new auger flights, bits, etc. $50,000 in cash for JV 10% equity in the claims, then within 1 month you provide about $4-5K for a drill project, then provide an additional $5K for assay costs after I prep samples. Additional earn-ins with the same rate and conditions will be available. 12 month lease or lease-purchase fee $25,000 in cash plus $25,000 in preferred stock, plus copies to me of all information, data, research, etc generated by you regarding the property. 100% of lease fee goes towards the purchase price if purchased at any time no later than the third annual lease renewal. In addition, a 1% overriding NSR agreement and a 1% perpetual stock equity agreement in your exchange listed stock are required with any transaction. Negotiations and other offers welcomed. The USA Rare Earth Col-Tan Placer is not available at this time.